Rookie Female driver, received CDL 11-05-18 from S.S.T.D.S. Have always loved driving my POV around the US, seems very right to be driving a truck around the US delivering freight. I am starting my first employment with May Trucking OTR 11-19-18. YES, the ladies are spoiled out here and any guy who's struggling, as Rainy said, gets laughed at, heckled on the CB, and even worse, ends up on YouTube. When I first began driving, I was literally told, "you'll be okay. Guy's will help you so take advantage if it, if you need it." Losing focus over a pee bottle is not helpful. Don't you have your own pee bottle or other possible annoyance as he sees it? When in Rome do as the Roman does. Team driving is difficult and being on the outside looking for a team driver, I have been told many negative things about it. You have the option of solo driving if you can't find a co-driver. Just as some men have hygiene issues so do some women. I wish you the best in finding a co-driver, but you have to be willing to give to receive. Expunged Records - Should I Report This? If you follow that logic what good is the expungement? Since legally the event never happened you have no duty to disclose. Now is that the practical answer, no, it's the legal answer. It just torques me off that employers expect you to obey each and every one of their rules yet they make an end run around employment law. What's good for the goose should be good for the gander, but that's not the real world. The OP will have to make his own decision, I was just trying to provide food for thought. Look having only one mistake in my whole life and than being wrong about that..... The best advice is discuss it out with the recruiter, usually they will tell you the company's policy on expungement and the need to report or not. State laws differ greatly what is done in California would never happen in Alabama. So simply ask the recruiter and go from there. Pssst Jamie. I think he is a she - Beth B.
Beth B. I agree with everyone else here that we need the details. If we don't know what you're up against how can we possibly help. Everyone here has probably made some kind of mistake in their life, some worse than others, but at the time it probably felt like the sky was falling. As for me, I'll try very hard not to judge. I will be waiting to hook up with my mentor / trainer while collecting layover pay until Wednesday.... (Thank you Rob you are the best Boss like ever ) For Eats likely just fry up some chicken and boil up some rice for me and the hubby. There won't be a xmas break because I will be on my first training run for 4 - 5 weeks. I am having a hard time believing this story, there are so many things wrong with the way it was allegedly handled no is no point in pointing them out as others already have. 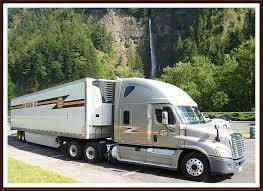 I just started at May trucking, beautiful, comfortable short nosed automatics that are governed to 60 mph. On the downslope of a hill with a tail wind maybe a whopping 67 mph, before my Dispatcher calls me to stop speeding...lol So 85 mph chasing, no sorry following safely for a hundred miles is impossible for me. I am out there to drive my 500 miles in 9 to 10 hours and be happy. So everyone one with a lead foot and aggressive driving tendency be forewarned, I will be in the slow lane watching the circus go bye. Thanks guys, I already have a Dr appt today and will get this checked out. So what happens if and when I don't get my medical card and self certify by the dead line? Do I lose my CDL and have to take all the training and test again? I have said this before, and I'll say it again, I do just a little better pay wise than I would as a company driver. But the reasons I am out here and my situation is different than most, so I am satisfied with the outcome. Just so the folks that don't know, yes I run a lease truck with Prime. I guess what sets me apart is that I don't come on here and make crazy statements about how much more money I'm making without having facts to back those statements. I think it is great that independants operate and succeed. Company or independant is not a right or wrong choice, it is a choice you make and learn from it.... hopefully. Recently my farm dump truck a cherry of a topkick 1997 decided it needed new front tires, 700 dollars later , I can say the tires look really great, but darn my wallet is very empty. Pre-paid legal services---yes or no? Insurance is ALWAYS a waste of money. Until you need it. Then it was worth every penny. ... The Dr refused to re cert me until I go to a regular Dr and get tested and on a treatment plan if needed. In the mean time my card expires in 3 days, it's Thanksgiving and she would not even give me a 30 card to make time to go to the Dr and get this all taken care of, which means if I drive after Friday I am illegal. I hoped you thanked your doctor, for his or her concern for your health and the concern for us other drivers on the road with you.